Could the peaceable principle of the Quakers be universally established, arms and the art of war would be wholly extirpated: But we live not in a world of angels. The reign of Satan is not ended; neither are we to expect to be defended by miracles. The pillar of the cloud existed only in the wilderness. In the nonage of the Israelites. It protected them in their retreat from Pharaoh, while they were destitute of the natural means of defense, for they brought no arms from Egypt; but it neither fought their battles nor shielded them from dangers afterwards. I am thus far a Quaker, that I would gladly agree with all the world to lay aside the use of arms, and settle matters by negotiation; but unless the whole will, the matter ends, and I take up my musket and thank heaven he has put it in my power. Whoever considers the unprincipled enemy we have to cope with, will not hesitate to declare that nothing but arms or miracles can reduce them to reason and moderation. They have lost sight of the limits of humanity. The portrait of a parent red with the blood of her children is a picture fit only for the galleries of the infernals. From the House of Commons the troops of Britain have been exhorted to fight, not for the defense of their natural rights, not to repel the invasion or the insult of enemies; but on the vilest of all pretences, gold. “Ye fight for solid revenue” was vociferated in the House. Thus America must suffer because she has something to lose. Her crime is property. That which allures the Highwayman has allured the ministry under a gentler name. But the position laid down by Lord Sandwich, is a clear demonstration of the justice of defensive arms. The Americans, quoth this Quixote of modern days, will not fight; therefore we will. His Lordship’s plan when analyzed amounts to this. These people are either too superstitiously religious, or too cowardly for arms; they either cannot or dare not defend; their property is open to any one who has the courage to attack them. Send but your troops and the prize is ours. Kill a few and take the whole. Thus the peaceable part of mankind will be continually overrun by the vile and abandoned, while they neglect the means of self defense. The supposed quietude of a good man allures the ruffian; while on the other hand, arms like laws discourage and keep the invader and the plunderer in awe, and preserve order in the world as well as property. The balance of power is the scale of peace. The same balance would be preserved were all the world destitute of arms, for all would be alike; but since some will not, others dare not lay them aside. And while a single nation refuses to lay them down, it is proper that all should keep them up. Horrid mischief would ensue were one half the world deprived of the use of them; for while avarice and ambition have a place in the heart of man, the weak will become a prey to the strong. The history of every age and nation establishes these truths, and facts need but little arguments when they prove themselves. But there is a point to view this matter in of superior consequence to the defense of property; and that point is Liberty in all its meanings. In the barbarous ages of the world, men in general had no liberty. The strong governed the weak at will; ‘till the coming of Christ there was no such thing as political freedom in any known part of the earth. The Jewish kings were in point of government as absolute as the Pharaohs. Men were frequently put to death without trial at the will of the Sovereign. The Romans held the world in slavery, and were themselves the slaves of their emperors. The madman of Macedon governed by caprice and passion, and strided as arrogantly over the world as if he had made and peopled it; and it is needless to imagine that other nations at that time were more refined. Wherefore political as well as spiritual freedom is the gift of God through Christ. The second in the catalogue of blessings; and so intimately related, so sympathetically united with the first, that the one cannot be wounded without communicating an injury to the other. Political liberty is the visible pass which guards the religions. It is the outwork by which the church militant is defended, and the attacks of the enemy are frequently made through this fortress. The same power which has established a restraining Port Bill in the Colonies, has established a restraining Protestant Church Bill in Canada. I had the pleasure and advantage of hearing this matter wisely investigated, by a gentleman, in a sermon to one of the battalions of this city; and am fully convinced, that spiritual freedom is the root of political liberty. Secondly. because in proportion that spiritual freedom has been manifested, political liberty has increased. Thirdly. Whenever the visible church has been oppressed, political freedom has suffered with it. Read the history of Mary and the Stuarts. The popish world at this day by not knowing the full manifestation of spiritual freedom, enjoy but a shadow of political liberty.—Though I am unwilling to accuse the present government of popish principles, they cannot, I think, be clearly acquitted of popish practices; the facility with which they perceive the dark and ignorant are governed, in popish nations, will always be a temptation to the lovers of arbitrary power to adopt the same methods. As the union between spiritual freedom and political liberty seems nearly inseparable, it is our duty to defend both. And defense in the first instance is best. The lives of hundreds of both countries had been preserved had America been in arms a year ago. Our enemies have mistaken our peace for cowardice, and supposing us unarmed have begun the attack. The Founders Corner Library is researched, compiled, edited, and formatted (with occasional commentary and explanatory notes) by Steve Farrell, Founder and Editor In Chief of The Moral Liberal. In this selection the spelling has been modernized in several places, and longer paragraphs have been split up for easier reading. Spelling modernizations and formatting in this online edition, and the Founders Corner Library collection as a whole, Copyright © 2013 Steve Farrell. 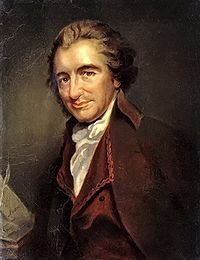 The copyright of Thomas Paine’s original copy of “Thoughts on Defensive War” is held in the Public Domain.